When it comes to the design, a flat roof system is antithetical to the typical style of roofs that cover most buildings in the western area of ​​the world. Contrary to the popularity belief that such a roof is not as good as a pitched roof, this roof system actually has many benefits. Flat roofs were originally developed in the arid climate of the Middle East, where snow accumulations or heavy rains are not a problem. For the same reason, similar systems have been developed on traditional houses in the Southwest America and Mexico. 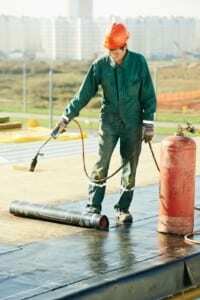 Today, commercial roof repair Fort Collins roofing materials offer advanced protection, so a flat roof is just as good as a pitched roof, hence its popularity, especially in the case of commercial buildings. Among the benefits of such a system are the low costs and the efficient use of all the available space. If in the case of a traditional roof, the surface beneath it cannot be fully used because of the angular slopes and the exterior surface cannot be used at all, the installation of a flat roof will allow the entire use of the whole area both above and below the roof. A flat roof can be used as a storage space, or to install terraces or green areas. Different building materials are used in the construction of flat roofs. Asphalt roofs are still the most common, but there are more efficient modern materials made of polymer-based composite liquids that seal the cracks very efficiently and prevent water infiltration.